Production of ethyl alcohol in distilleries based on cane sugar molasses. The world’s total production of alcohol from cane molasses is more than13 million m3/annum. The 295 distilleries in India produce 2.7 billion litres of alcohol and generating 40 billion litres of wastewater annually. The enormous distillery wastewater has potential to produce 1100 million cubic meters of biogas. The population equivalent of distillery wastewater based on BOD has been reported to be as high as 6.2 billion. The wastewater from distilleries, major portion of which is spentwash, is nearly 15 times the total alcohol production. This massive quantity, approximately 40 billion litres of effluent, if disposed untreated can cause considerable stress on the water courses leading to widespread damage to aquatic life. DILUTION– Molasses available from Indian sugar mills has a solid content varying between 76 and 90%.In diluter, solid concentration of molasses is brought down to 20-25o Brix. SEPARATION– Substrate is separated into alcoholic solution and yeast sludge by centrifugation. The recuperation of yeast is important in order to reduce the organic load of the wastewater. The air pollutants resulting from Distillery operations will be SPM, SO2 and Nox emitted from the boiler. The air emission from the boiler will be dispersed through suitable pollution control equipments. Emission of particulate matter along with oxides will affect vegetation around the unit. The effects may vary from bleaching of leaves, reduction in effective leaf area for photosynthesis to adverse damage like death. This could be overcome by following proper environment management plan. To meet out the industrial noise level prescribed by the Factory Act [90dB(A) for 8hrs working]. Suitable acoustic measures such as proper engineering design acoustic methods; suitable barriers and enclosures are proposed to reduce the noise level. 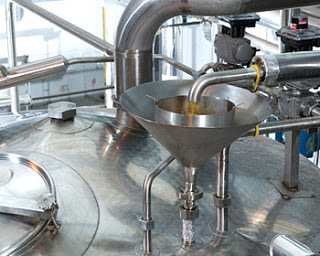 The high temperature of the spent wash from the distillation process have to be adjusted at least to the maximum values tolerable for the biologic degradation. Flow regulation, mixing Strong variations in the volumetric flow of the wastewater have to be compensated by storage/equalization capacities and appropriate dosage/mixing device. The spent wash should be kept separately from other wastewater streams (cleaning water) in order to ensure maximum control of its concentration. Conditioning of pH-Value The usually low pH-value has to be corrected by neutralization. Nutrients, suspended solids : The content of macro-/micro-nutrients and suspended solids usually range within the tolerable limits for anaerobic bacterial activity. Should the values exceed the limits in individual cases, these need to be adjusted. UASB (Upflow Anaerobic Sludge Blanket) – Reactor Anaerobic reactor with up-flow regime of the treated wastewater, sludge retention and 3-phase separation for the separation of methane, sludge and treated wastewater. Anaerobic Filter (Fixed Bed Reactor): Reactor with an inert filter medium with a high specific surface for on-growth of biomass (today mostly plastic material), mostly with external separation and recirculation of sludge. Anaerobic Contact Process: Totally mixed reactor with separation and recirculation of sludge to the methanogenic reactor. The realization of sludge-degassing improves the sludge consistency for separation. Incineration after evaporation: The water content of the spent wash is significantly decreased by evaporation, so that the dried substrate is suitable for incineration containing about 37% of potash as potassium oxide on an average from which potassium is recovered in the form of potassium salts. This potassium is used as a fertilizer or, with the addition of chemicals, for the recuperation of K2SO4 and CaSO4. The adverse environmental effects of disposal of untreated spent wash are avoided, but the high energy demand of the evaporation process that will in most cases be met by using fossil sources of energy should be taken into consideration. Composting: In this process, press mud generated from sugar mill is utilised to produce compost by mixing distillery effluent. Both anaerobic and aerobic composting systems are practiced. In some plants composting with treated effluent treated through bio-methanation plant is also practiced. This system can achieve zero effluent if the press mud quantity matches with the effluent generated. Spray-irrigation: The spent wash is applied directly to agricultural land for fertilising purposes. Due to the high organic loading, this can however lead to undesired accumulation of nutrients in the soil and to infiltration of soluble components to groundwater. Growing of algae and fungus: Owing to its high protein content and nutritional value, the spent wash can be used as nutritional substrate for the growing of algae and fungus. Ò Lt Col Mantha Nagaraj, Dr Arvind Kumar, “Distillery Wastewater Treatment And Disposal” , IIT Roorkee. Ò Naturgerechte Technologien, Bau- und Wirtschaftsberatung (TBW), “Anaerobic Methods of Distillery Waste and Wastewater Treatment”, GmbH Frankfurt, Germany, June 2000. Ò Ministry of Environment and Forests, Government of India, “ Technical EIA Guidelines for Distilleries”, IL & FS Ecosmart Limited, Hyderabad, September 2009.